Although this book contains many high-quality photographs and a professional layout, it will not hold the interest of most readers. Maybe seven authors make it impossible to put together an attention-grabbing narrative for an entire book. Although the book does not specify how the authorship got divided up, most likely each author got one chapter since there are seven chapters in total. Two chapters, which make up about a quarter of the book, do not deal with "the lost submarines of Pearl Harbor," which is the title of the book, but rather discuss the history of Japanese midget submarines after the attack on Pearl Harbor to the end of World War II. This long diversion even includes six pages on the Japanese kaiten (human torpedo), which was not a midget submarine at all but rather a modified Model 93 "Long Lance" torpedo steered by one man. 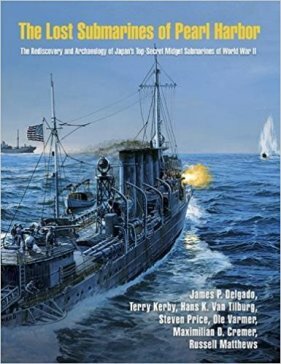 The Acknowledgments section at the front correctly states that Burl Burlingame's book, Advance Force Pearl Harbor (1992), "was the first and remains the definitive book on the role of Japanese submarines in the Pearl Harbor attack" (p. IX). Whereas Burlingame's many years of experience as a newspaper journalist resulted in a fascinating story about the Japanese midget submarine attack at Pearl Harbor, The Lost Submarines of Pearl Harbor lacks clear direction in its storyline and at times has extremely technical details, such as those in Chapter 5 on "The Ward Midget" and Chapter 6 on "The Three-Piece Midget," which make it difficult to continue reading to the end. 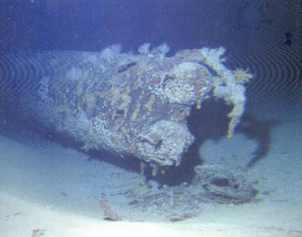 James Delgado, the first of seven authors listed, has written a much more accessible book on a subject of naval archeology, Kamikaze: History's Greatest Naval Disaster (2010), but this book on the Pearl Harbor midget submarines falls far short in making this technical subject interesting for the general reader. All five Japanese Type A kō-hyōteki midget submarines used in Pearl Harbor attack now have been located. Chapter 5 tells how the last midget submarine was found in 2002. This midget submarine was identified as the one sunk by the destroyer Ward (DD-139) by the shell hole in the conning tower. The Ward's No. 3 gun hit the midget submarine's conning tower about an hour before the Japanese aerial attack began on December 7, 1941. The authors summarize arguments to support identification of the five different submarines but do not arrive at a consensus. 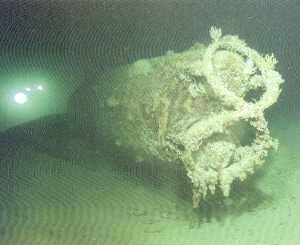 They also disagree on whether or not one of the midget submarines entered the harbor and fired two torpedoes into Battleship Row. The ten men who manned the five two-man midget submarines to attack Pearl Harbor were designated as a tokubetsu kōgekitai or abbreviated to tokkōtai (meaning special attack unit), since they had little chance of surviving the attack even though they arranged to rendezvous after the attack with the I-boats (larger submarines) that had carried them from Japan to Pearl Harbor. They were the first tokkōtai members of the Pacific War, which starting in October 1944 also included airmen in the Kamikaze Special Attack Corps who made suicide attacks against enemy ships. Bow of the Ward midget in 2002 (p. 131). Bow of the Ward midget in 2014 (p. 131).